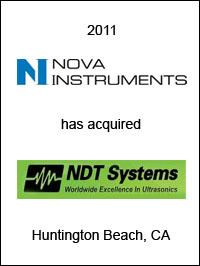 Nova Instruments Corporation, Woburn, MA, has acquired NDT Systems Inc. based in Huntington Beach, California. NDT designs, manufactures, and sells high quality and advanced technology ultrasonic testing products such as thickness gauges, bond testers, portable flaw detectors as well as eddy current coating thickness devices. “Over the past 40 years, NDT Systems has established itself as a leader in the non-destructive testing market and makes NDT Systems a natural fit to the Nova Instruments’ portfolio of businesses.” said Jim Barbookles, Chairman and CEO of Nova Instruments Corporation. EC Mergers & Acquisitions acted as exclusive financial advisor to Nova Instruments on this transaction.